They all want Monti longer... because they all fear Beppe Grillo's revolution! In Italy, a consensus is slowly building around a second term for Mario Monti's technocratic government – but could this have less to do with national unity in economically difficult times than with political elites in a last-ditch defence against the threat of Beppe Grillo's populism? Comedian-turned-civil activist Beppe Grillo. Demotix/Luca Faccio. All rights reserved. Looking at Italian politics, it is clear that the country's destiny is unequivocally tied with that of Mario Monti and of Europe. Monti has repeatedly ruled out the option of re-candidacy in April 2013, when his mandate as Prime Minister will come to an end. But there is an increasing number of political leaders who would like the Government, led by technocrats and "Super Mario", to stay in power for another term. According to many of them, Monti is providing (and will provide) the European Union and international institutions with credibility, especially after the reputational damage of Silvio Berlusconi's scandals and 'bunga bunga' parties. Mr Monti is certainly a key player on the European stage: he has brought about severe spending cuts which most Italians have accepted and is seeking to restore growth and confidence in the future. Italy has one of the world's highest public debts: even under Monti's administration, it has increased to over 121% of GDP. Stronger cuts are necessary, as increasing taxes is not enough to avoid a long-lasting recession. Nonetheless, the Italian Parliament is home to diverse, vested interests, and if Monti was to show too much political bravado against the parties who support his wide coalition, it may turn into another crisis for Italy and anticipated elections. Just a few days ago, the Governor of the province of Lazio (of which the capital, Rome, is the main city) Renata Polverini, resigned after wrongdoings by members of the Regional Assembly, who were caught paying for their private business and tremendously expensive dinners at luxurious restaurants with public funds. This is only the latest scandal in Italian politics, and more and more Italians are adhering to so-called "anti-politics" , defined by populism and Euro-scepticism. But what do these terms mean in the Italian context? And why have mainstream politics been so prompt to draw these rather arbitrary narratives and ideological barriers? The populist Movimento 5 Stelle ("Five Star Movement", M5S), led by comedian-turned-civil leader Beppe Grillo, is seen by many Italians as the only political faction with an idea for the future and wise governability. Whereas most Italians listen to and watch traditional TV talk-shows that abound with sterile fights and swearwords, the comedian Grillo is travelling around the country to give speeches and arrange debates with citizens about education, the environment or employment. Most importantly, the activist and blogger is posting insightful videos and debates around key topics for the country and the world, along with comments written by experts in, for example, renewable energy, healthcare and transport. Hundreds of thousands of clicks on Grillo's website demonstrate that those posts generate common interest and controversies that people are keen to discuss. They are at least happy to share their opinions on them in virtual space. The quality of these publications and the popular feedback they've received tell us a lot about Italian politics in the era of social media, where active citizens want to interact with each other and their leaders. Furthermore, Italians are tired of narratives based around obsolete right/centre/left ideologies, which figure in most position papers and political programmes published by the traditional parties. Indeed, there is a growing resentment towards this leadership across the board, especially after the Parliament has repeatedly refused to publicly discuss a bill proposal, signed by more than 350,000 people, which would reform the electoral system so that Italians could actually elect their favourite candidate as a Member of Parliament. Under the current system, which is likely to be used in the upcoming April 2013 election, Italian voters cannot give their vote to a specific candidate, but only to a blocked list established by the parties themselves. In other words, a handful of senior politicians will once again decide who will get access to political power and who will stay out. The President of the Republic, Giorgio Napolitano, as well as many government members and political leaders (and entrepreneurs such as Luca Coredero di Montezemolo, the chief of Ferrari and one of the wealthiest men in the country), argue that Monti should be Prime Minister even after the original end of his term in April 2013. By proposing this solution to 'restore trust' in Italy's capacity to repay its debts under the leadership of a consensual figure, many coalition politicians from both sides of the Parliament also hope to see their interests preserved, as they would remain in government and play a decisive role in parliamentary decisions during the next term. But the increasing consensus built around "Monti bis" may also be a sign of the fear inspired by the anti-politics of the Five Star Movement. Albeit internal controversies and divergences are starting to surface inside the movement (Grillo himself has been accused of slowly becoming a "Padre Pedrone" -"father and master" - undemocratically chosen and deciding everything), surveys show that the M5S's popularity is growing. As a consequence, and given that traditional political parties are in steady decline, the clash between old interests and parties with the new type of anti-politics offered by the M5S is the subject of many discussions in the higher spheres of power. Grillo and his followers are resolute to punish corruption and unwise spending. There is a widespread worry that Beppe Grillo might start a political earthquake, a revolution aiming to destroy traditional political leadership, seen as morally bankrupt and deeply corrupted, as several scandals have showed in the past two decades since the “Clean hands” investigation in 1992. Therefore, Italian politicians are trying to build a thick wall between the mainstream politics of Berlusconi's PdL (People of Freedom), Bersani's Pd (Democratic Party) or the Fini-Casini alliance, and the rest, which includes a weakened Northern League, Di Pietro (the popular judge who was one of the magistrates behind the "Clean hands" investigations) and Beppe Grillo. 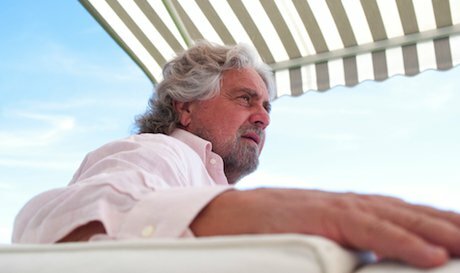 But, as recent polls indicate that the M5S might get up to 22% of the vote in the upcoming election, it is Grillo's group and its call for a dramatic change in Italian politics that these parties worry about the most. The candidates the Five Star Movement are presenting are generally professionals who had never been involved in politics before, and who are enthusiastic about their new mission. This is what happened in Parma in the last elections, when Grillo-backed Federico Pizzarotti won the Mayoral race, and this is what is happening in Sicily, where Giancarlo Cancelleri is running under the movement's banner in the next regional elections (which will be held at the end of this month). In an environment where most political leaders have made a living out of politics – either in the government or in parliament – for decades, this is a true revolution. Many are also afraid of Grillo because his candidate was capable of winning the mayoral seat in Parma with no state funding whatsoever, spending no more than 6,000 euros in the electoral campaign, triumphing over much richer political parties – all of whom receive millions of euros of public funds, with no control of their expenses as they are not required to present any invoices. In sum, there is evidence suggesting that the Monti "club" is not on the rise because of convinced political support, nor out of public popularity, but because of political calculation. This "club" is profoundly antidemocratic as its members would consent to support a government of technocrats imposed by Brussels to stop a big democratic wave that could potentially shatter long-established political interests in favour of more citizen awareness and participation. A second government led by Monti - or by the current Minister of Economic Development, Corrado Passera – would still be run by the same politicians who caused (and aggravated) the present situation with their unwise spending and absence of a positive vision for the country's future. With or without Grillo, this is not what Italy deserves.